Perfect for graduation,bachelorette,engagement,hawaii,bridal shower,wedding,birthday,indoor or outdoor decor,or any theme parties. What you will get: 1pcs Gold Glittery Drink Drank Drunk Party Banner,1pcs gold glitter paper circle dot banners,perfect for party decorations. Perfect for graduation,bachelorette,engagement,hawaii,bridal shower,wedding,birthday,baby shower,hawaii,indoor or outdoor decor,or any theme parties. 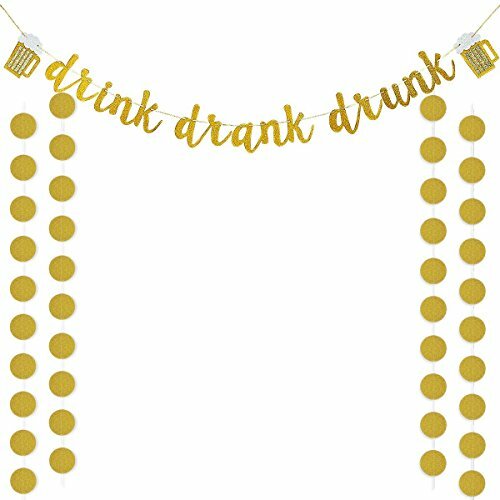 Gold Glittery Drink Drank Drunk Party Banner: Each letter length approx is 4.5".Gold glitter paper circle dot banners diameter: 2inch, in total 25pcs Circle dots. Perfect for hunging from branches and ceilings, or open against a wall, hanging up dessert tables, backdrops, and the overall party space,the adornment of the integral collocation of color is also very perfect place you want to decorate. If you have any questions about this product by LeeSky, contact us by completing and submitting the form below. If you are looking for a specif part number, please include it with your message. Congrats Nurse Banner, Nurse Graduation Decor, RN Graduation Sign.